Mars is the fourth planet from the Sun and it orbits the Sun just outside the Earth. Its orbital radius is about 1.5 times that of the Earth-Sun distance. This Earth-Sun distance is generally referred to as 1 astronomical unit (or 1 AU). Mars is a smaller planet than the Earth. The size of spherical objects, such as that of the planets, are best described by a mean radius. The mean radius is the average distance from the center to the surface of the planet. Mars' mean radius is about 3,396 km, as compared to Earth's, which is 6.378 km. Mars' mass is about 6.4 x 1023 kg. 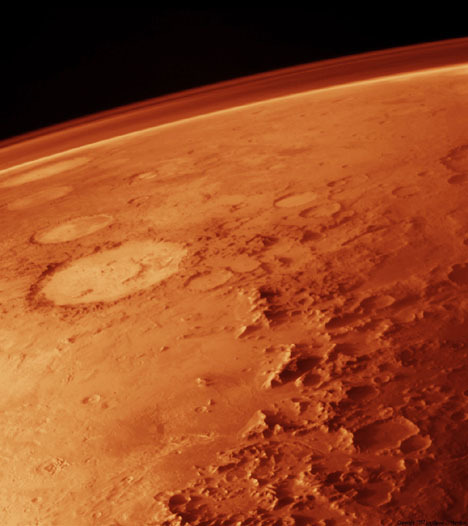 Thus, the average density of Mars is about 3,900 kilograms per cubic meter. This suggests that the planet must be composed largely of silicate materials that have a density ranging from 2,700 to 4,500 kilogram per cubic meter, depending on the composition and pressure. Because it is less massive than Earth, Mars' surface gravity is only about 38% of the surface gravity on Earth. Unlike the Moon or Mercury, Mars spins at a relatively fast speed. Its spinning period is almost identical to that of the Earth. Because its spinning axis is tilted with respect to the ecliptic plane (i.e., the orbital plane of most of the planets) by 24.5 degrees (similar to the tilt of Earth's axis) the surface of Mars experiences seasonal variations just like the Earth. Mean temperature variation between day and night at the surface is about 50 degrees Kelvin, much smaller than that on the Moon or Mercury. The reason for this small temperature difference is the existence of an atmosphere on Mars. From the Viking orbiter, the Martian atmosphere is clearly visible (Figure 1.1) . As the orbiter looked towards the horizon, a thin layer of haze could be seen above the terminus. Although the atmospheric pressure is very low (only about 6% of the surface air pressure on Earth), it is massive enough to be visible. Martian atmosphere is composed mainly of carbon dioxide (95%), nitrogen (3%), argon (1.6%), oxygen and some other rare gases. Judging from the composition alone, it is clear that the Martian atmosphere must have been formed subsequent to the planet formation, possibly produced by early global volcanic events. Otherwise, the dominant components of the atmosphere would be hydrogen and helium like those of the outer planets in our Solar System.